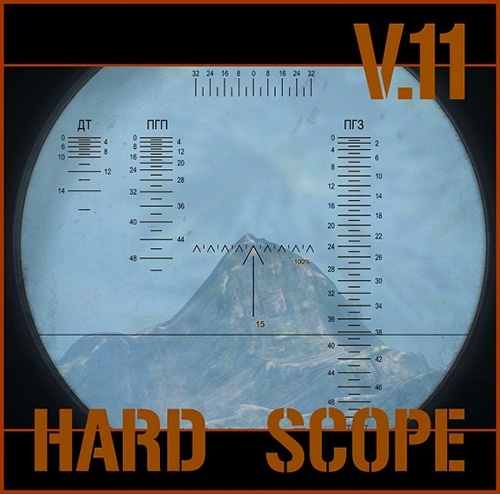 HARDscope — this 19 historical (sniper and arcade) sights with timer reloading and information about the target. This product has the ability to select the historical grid directly in the game. Changing the type and sight reticle is happening in the game settings. PT- 1 — T-26, BT-5, BT-7, BT-7M, T-28, T-35, A-20, T-46. TS -15 — T-34- 85, SU-85. TS — 2B -32P — T-54, T-55. TMPD-7 — HF gun ZIS- 5 (as well as for T-34 gun F-34 ), KV-1, KV-85, T34/76. TS-17 — IS-2, IS-122, IS-3. TS-45 — IS-4, IS- 7. CT- 10 — SU-152, ISU-152. TZF4 — PzKpfw.II, PzKpfw.II Luchs, VK 1602 Leopard. T.Z.F.43 (t) — Pz.35 (t), Pz.38 (t). T.Z.F.5b — PzKpfw.IV Ausf A-F1. T.Z.F.9b — PzKpfw.VI Tiger Ausf.E. TZF9d — PzKpfw.VI Tiger II Ausf.B with Porsche turret. Sfl.ZF1a — Late StuG III, StuG IV, Hetzer, Panzerjager IV, Jagdpanther, Ferdinand. PaK.Z.F.3×8 — Marder II, Marder III. M38 — M4 Sherman, M7. M10 — M4A3E8 Sherman, M46 Patton. APX L 671 — D2, B1, D1, AMX 38, AMX 40. 2. Folder «gui» and «text» from the archive to put World_of_Tanks \ res_mods \ 0.9.14 \, confirming the replacement.